Dental alveoli (singular alveolus) are sockets in the jaws in which the roots of teeth are held in the alveolar process with the periodontal ligament. The lay term for dental alveoli is tooth sockets. A joint that connects the roots of the teeth and the alveolus is called gomphosis (plural gomphoses). Alveolar bone is the bone that surrounds the roots of the teeth forming bone sockets. 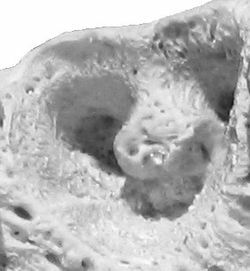 Alveola of the second premolar tooth in a bovine maxillary bone. In mammals, tooth sockets are found in the maxilla, the premaxilla, and the mandible. Socket preservation or alveolar ridge preservation (ARP) is a procedure to reduce bone loss after tooth extraction to preserve the dental alveolus (tooth socket) in the alveolar bone. A platelet-rich fibrin (PRF) membrane containing bone growth enhancing elements can be stitched over the wound or a graft material or scaffold is placed in the socket of an extracted tooth. The socket is then directly closed with stitches or covered with a non-resorbable or resorbable membrane and sutured. The swelling of the dental alveoli can result in alveolitis, causing pain and discomfort to the mouth. ^ Peck, Mogammad Thabit; Marnewick, Johan; Stephen, Lawrence (2011). "Alveolar Ridge Preservation Using Leukocyte and Platelet-Rich Fibrin: A Report of a Case". Case Reports in Dentistry. 2011: 1–5. doi:10.1155/2011/345048. ISSN 2090-6447. ^ Khiste, Sujeet Vinayak; Naik Tari, Ritam (2013). "Platelet-Rich Fibrin as a Biofuel for Tissue Regeneration". ISRN Biomaterials. 2013: 1–6. doi:10.5402/2013/627367. ISSN 2314-4025. ^ Fickl, Stefan; Zuhr, Otto; Wachtel, Hannes; Stappert, Christian F. J.; Stein, Jamal M.; Hürzeler, Markus B. (2008). "Dimensional changes of the alveolar ridge contour after different socket preservation techniques". Journal of Clinical Periodontology. 35 (10): 906–913. doi:10.1111/j.1600-051X.2008.01305.x. ISSN 0303-6979.